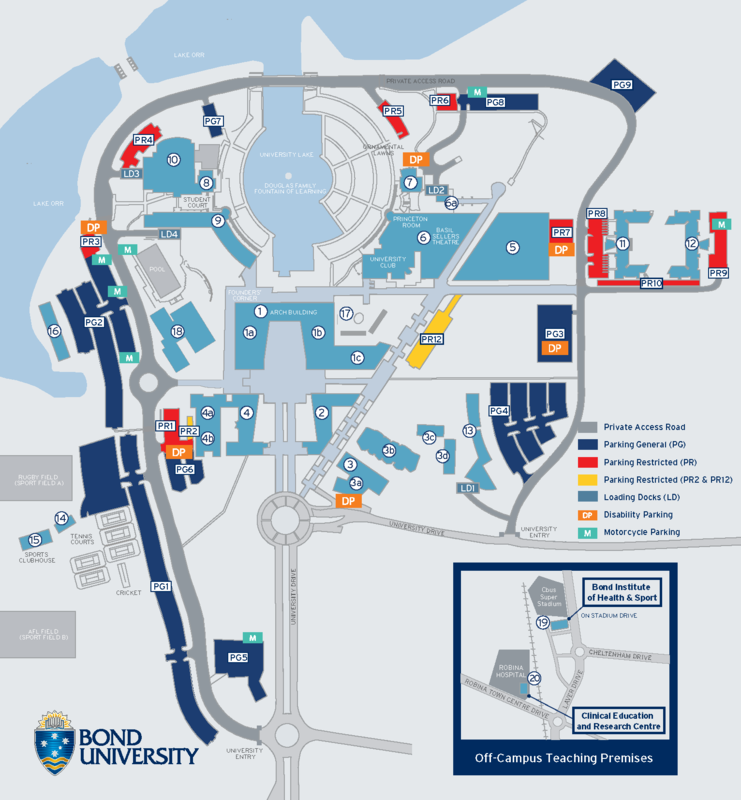 Bond University provides parking for students, staff and visitors. Parking on campus is free of charge. The speed limit on campus is 20kph. Vehicles must be parked according to signage and within the marked lines of a single parking bay. Persons parking motor vehicles and bicycles on campus do so at their own risk. Bond University is not responsible for fire, theft or loss or damage of any kind to any vehicle or contents thereof whilst on university property. All parking regulations apply 24-hours a day, 365 days a year. All staff and students wishing to park a vehicle on campus must complete a vehicle registration form at the security office. Student/Staff ID cards must be presented when applying for a permit. Your registration will be logged and used with Licence Plate Recognition. If you sell or change your vehicle, you must update your details with security to obtain a new parking permit. Students residing on campus will be issued a parking permit semesterly. Those sponsoring/organising a group or conference should contact security office well in advance of the event to obtain advice re visitor parking. By entering and leaving your vehicle in this car park you accept the following terms and conditions which constitute a legal agreement with Bond University. If you do not accept these terms and conditions you must immediately leave this carpark. Parking within Bond University is only permitted by following the Vehicle Registration process. All vehicles must be registered with Bond University or have obtained permission from Bond University Security. Bond University authorises Pripark (QLD) Pty Ltd to enforce the carpark terms and conditions as described. If you breach any of the terms and conditions in clause 1, then in respect of each breach you agree to pay Pripark (Qld) Pty Ltd a parking fee of $55.00. You further agree that Pripark (Qld) Pty Ltd may give notice of a claim for a parking fee by affixing a tax invoice to your vehicle. If the parking fee referred to in clause 4 is not paid by the due date stated on the tax invoice, then an amount of $43.00 will be charged for costs to Pripark (Qld) Pty Ltd associated with recovering the parking fee. If the parking fee plus recovery cost remains unpaid for a further 7 days after the due date then Pripark (Qld) Pty Ltd may take legal action to recover the same. In that event you further agree to pay legal costs of $77.00 for Pripark (Qld) Pty Ltd lawyers to demand payment and to indemnify Pripark (Qld) Pty Ltd in respect of all other legal costs and disbursements incurred by Pripark (Qld) Pty Ltd to recover the parking fee and associated recovery costs. AND you agree to immediately comply with that request. a) Pay a minimum removal fee of $400.00 to the towing operator. You must remove all valuables from your vehicle and secure it when unattended. Bond University does not represent or warrant that secure parking is available in this car park and shall not under any circumstances be responsible for any loss or damage to or theft of your vehicle or its contents. You agree that Bond University and its contractors shall not under any circumstances be liable or responsible for any injury, loss or damage to person or property, whether arising in bailment, contract or tort or otherwise how so ever described and all injury, loss and damage to any person or property is at the sole risk of persons entering in and/or leaving their vehicles in this car park. You agree to indemnify Bond University and its contractors against any and all claims, costs, demands, expenses and legal proceedings what so ever and how so ever described, incurred or suffered by it and its contractor arising out of your breach of these terms and conditions, your negligence, acts or omissions, or the use of this car park to park your vehicle. No person other than Bond University or Pripark (Qld) Pty Ltd has authority to vary, waive or excuse compliance with any of these terms and conditions. Bond University agrees that your vehicle may remain in this car park provided that you do not breach any of the above mentioned terms and conditions. Bond University has engaged Pripark (Qld) Pty Ltd, to enforce its car park terms and conditions this includes its authorised agents, contractors, employees, successors and assigns. Download a copy of Car Park Terms and Conditions of Use. Despite the growing number of parking infringement notices issued over the last 2 years (over 1,900), Bond has not been able to enforce a penalty associated with any infringement. Our control over our own parking areas has therefore been ineffective. It is necessary to have appropriate oversight and penalties in place to ensure that our community parks in the right places so as not to inconvenience or obstruct emergency vehicles, access to disability parking or obstruct others due to parking in a manner that puts car park users in danger. There has also been an impact upon those allocated restricted parking spaces which have been provided in recognition that their University duties will require them to drive off campus from time to time when that dedicated space is occupied by an unauthorised vehicle when they return to work. All vehicles must be registered with security. Their office is located on ground floor of Building 10 contact # 5595 1234 and owner’s details will be added to the database and a parking permit will be issued. The permit should be affixed to the lower passenger side of the windscreen. What do I do if I get a parking penalty? Make payment to the contracted provider of parking supervision, PriPark Private Parking Management via online, phone, or mail as identified on the ticket issued within 7 days or an additional administrative fee of $43.00 will be applied. If this is not paid within a further 7 days, subsequent penalties will apply for non-payment of the fee plus recovery costs. Information is detailed at Car Park Terms and Conditions of Use signage on display at both points of entry to the University campus. In what circumstances do I risk my vehicle being towed away? If your vehicle is dangerously parked in a way that potentially impacts the safety of others, Security will make every attempt to contact you via the contact information that you have provided on your registration form. If Security is unable to contact you to move your vehicle a towing company will be engaged to do so. Charges for vehicle recovery start at approximately $400 (paid to towing company) and will escalate, subject to length of time your vehicle is left at the impound yard.